Global polar sea ice area in June 2013 remained at or slightly above climatological normal conditions (1979-2008). This follows early 2013 conditions’ improvement from September 2012′s significant negative deviation from normal conditions (from -2.5 million sq. km. to +500,000 sq. km.). Early austral fall conditions helped create an abundance of Antarctic sea ice while colder than normal boreal spring conditions helped slow the rate of ice melt in the Arctic. The NSIDC made a very important change to its dataset in June. With more than 30 years’ worth of satellite-era data, they recalculated climatological normals to agree with World Meteorological Organization standards. The new climatological era runs from 1981-2010 (see Figure 5 below). What impacts did this have on their data? 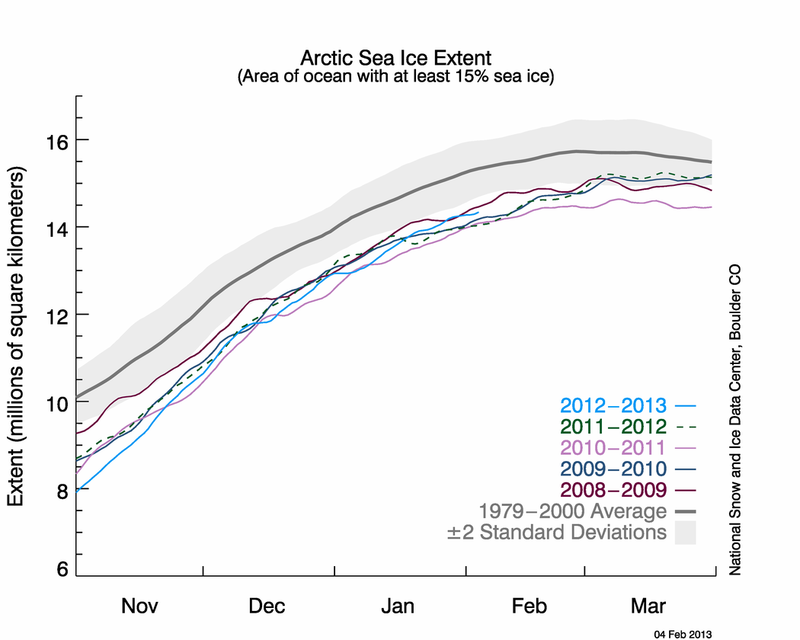 The means and standard deviations now encompass the time period of fastest Arctic melt. As a consequence, the 1981-2010 values are much lower than the 1979-2000 values. This is often one of the most challenging conditions to explain to the public. “Normal”, scientifically defined, is often different than “normal” as most people refer to it. U.S. temperature anomalies reported in the past couple of years refer to a similar 1981-2010 “normal period”. Those anomalies are smaller in value than if they were compared to the previous 1971-2000 “normal period”. Thus, temperature anomalies don’t seem to increase as much as they would if scientists referred to the same reference period. 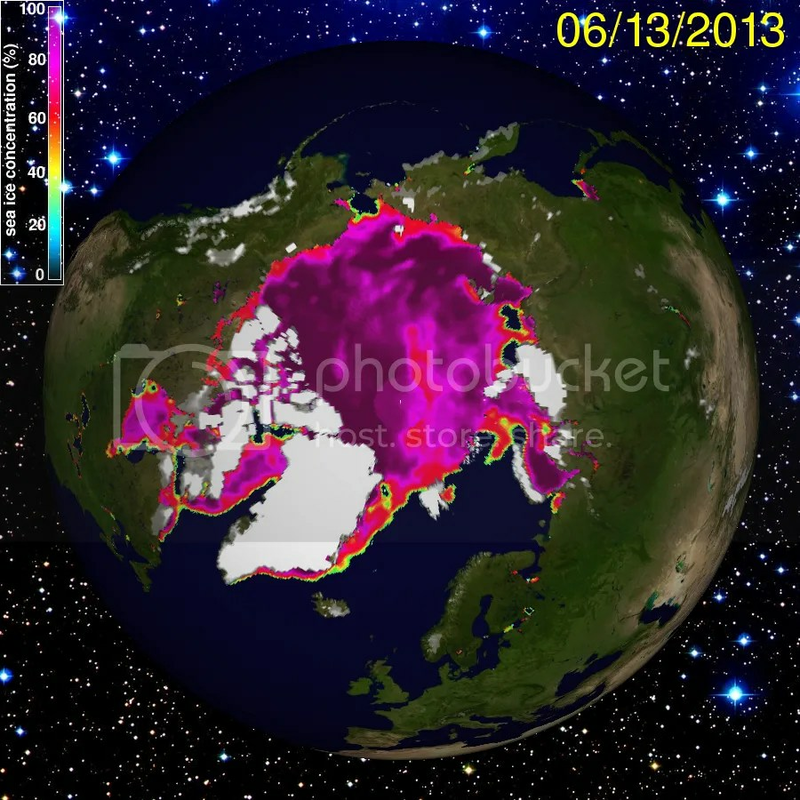 According to the NSIDC, sea ice melt during June measured 2.10 million sq. km. This melt rate was slower than normal for the month, but June′s extent remained below average – a condition the ice hasn’t hurdled since this time last year. Instead of measuring near 11.89 million sq. km., June 2013′s average extent was only 11.5 million sq. km., a 300,000 sq. km. difference. Barents Sea (Atlantic side) ice remained below its climatological normal value during the month, which continues the trend that began this last winter. Kara Sea (Atlantic side) ice temporarily recovered from its wintertime low extent and reached normal conditions earlier this year, but fell back below normal during May through June. Arctic Basin sea ice (surrounding the North Pole) fell below normal during June due to earlier weather conditions that sheared ice apart. The Bering Sea (Pacific side), which saw ice extent growth due to anomalous northerly winds in 2011-2012, saw similar conditions in December 2012 through March 2013. Since then, Bering Sea ice extent returned to normal for this time of year: zero. The previous negative Arctic Oscillation phase gave way to normal conditions throughout June. However, a stronger than normal Arctic Low set up which kept Arctic weather conditions cooler and stormier than normal. 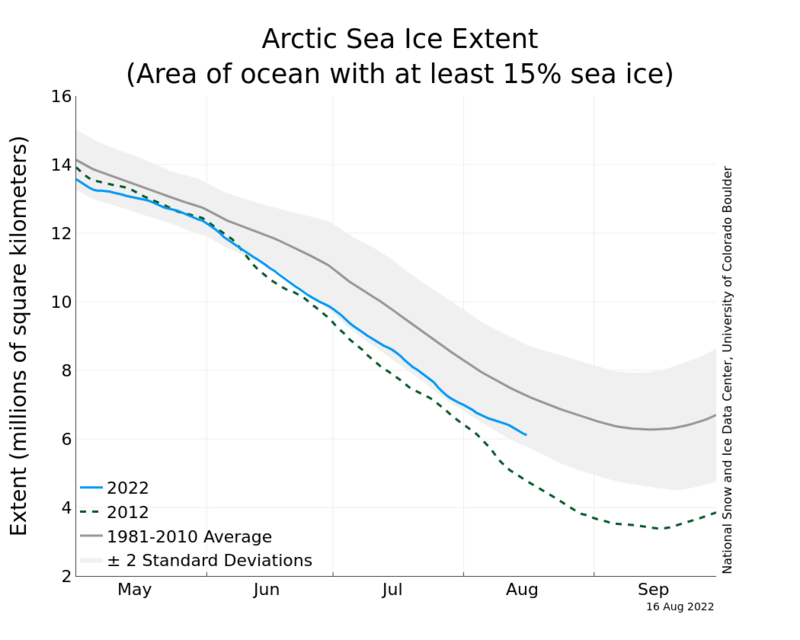 These conditions prevented Arctic sea ice from melting as quickly in June as it did in 2012. In the past few days, these conditions eased and rapid Arctic melt is once again underway. I’ll have more to say about this in next month’s post. For the first time in a number of years, Arctic sea ice extent in June didn’t reach a bottom-ten status. 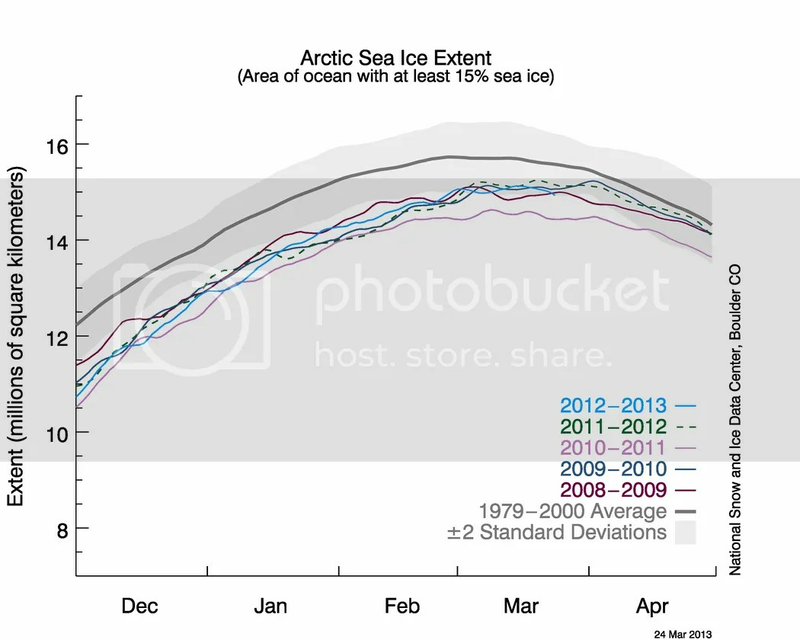 June Arctic sea ice extent was “only” the 11th lowest on record. In terms of climatological trends, Arctic sea ice extent in June decreased by 3.6% per decade. This rate is closest to zero in the late winter/early spring months and furthest from zero in late summer/early fall months. Note that this rate also uses 1981-2010 as the climatological normal. There is no reason to expect this rate to change significantly (much more or less negative) any time soon, but negative rates are likely to slowly become more negative for the foreseeable future. Additional low ice seasons will continue. Some years will see less decline than other years (e.g., 2011) – but the multi-decadal trend is clear: negative. The specific value for any given month during any given year is, of course, influenced by local and temporary weather conditions. But it has become clearer every year that humans have established a new climatological normal in the Arctic with respect to sea ice. This new normal will continue to have far-reaching implications on the weather in the mid-latitudes, where most people live. 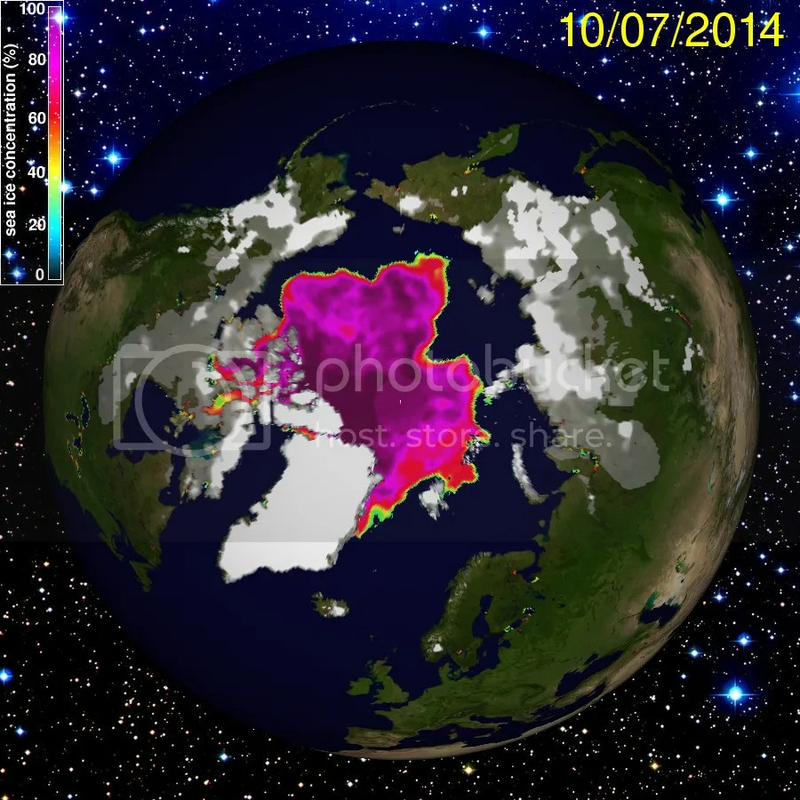 Figure 1 – UIUC Polar Research Group‘s Northern Hemispheric ice concentration from 20130613. 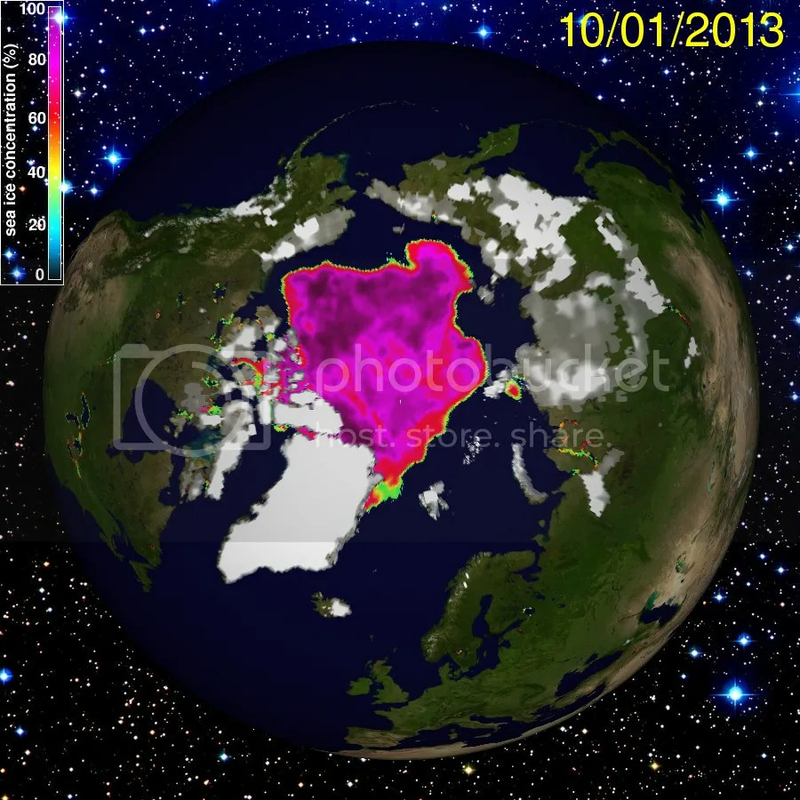 Figure 2 – UIUC Polar Research Group‘s Northern Hemispheric ice concentration from 20130704. 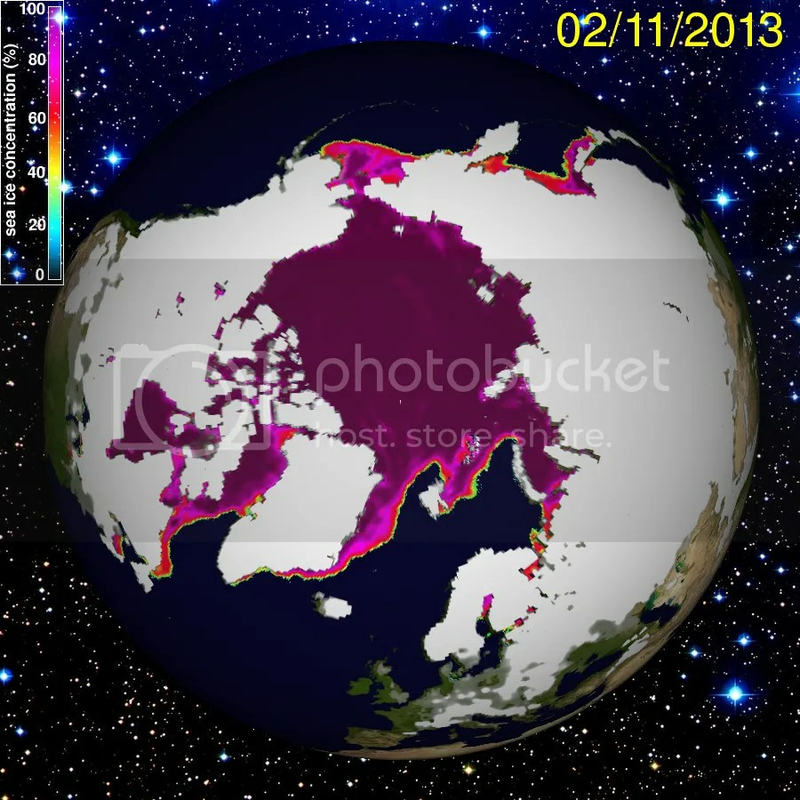 Continued melt around the Arctic ice periphery is evident in the newest figure. Hudson Bay ice is nearly gone. Rapid melt is also evident in the Kara, Barents, and Bering Seas. Compared to last year at the same time, more ice is present in the Baffin/Newfoundland, Beaufort, and Kara Seas. This is due to interannual weather and sea variability. The climate trend remains clear: widespread and rapid sea ice melt is the new normal for the Arctic. So far, the early season thinning of sea ice near the North Pole hasn’t caused a mid-season mid-ocean collapse of sea ice, as many people feared. This is not to say that rapid ice melt in the central Arctic Ocean will not happen this year. We simply have to wait and see what happens before we issue obituaries. Figure 3 – PIOMAS Arctic sea ice volume time series through June 2013. As the graph shows, volume (length*width*height) hit another record minimum in June 2013. Moreover, that volume remained far from normal for the past three years in a clear break from pre-2010 conditions. Conditions between -1 and -2 standard deviations are somewhat rare and conditions outside the -2 standard deviation threshold (see the line below the shaded area on the graph above) are incredibly rare: the chances of 3 of them occurring in 3 subsequent years under normal conditions are extraordinarily low (you have a better chance of winning the Powerball than this). Hence my assessment that “normal” conditions in the Arctic shifted from what they were in the past few centuries; humans are creating a new normal for the Arctic. Note further that the ice volume anomaly returned to near the -1 standard deviation envelope in early 2011, early 2012, and now early 2013. In each of the previous two years, volume fell rapidly outside of the -2 standard deviation area with the return of summer. That provides further evidence that natural conditions are not the likely cause; rather, the more likely cause is human influence. Figure 4 – NSIDC Arctic sea ice extent time series through early July 2013 compared with five recent years’ data, climatological norm (dark gray line) and standard deviation envelope (light gray). As you can see, this year’s extent (light blue curve) remained at historically low levels throughout the spring, well below average values (thick gray curve), just as it did in the previous five springs. Sea ice extent did something different this spring and early summer: the late season surge of ice formation seen in the 2009, 2010, and 2012 curves was not as strong this year; the early summer surge of ice melt seen in the 2010, 2011, and 2012 curves was also not as strong this year, at least not until the last week or so. This graph also demonstrates that late-season ice formation surges have little effect on ice extent minima recorded in September each year. The primary reason for this is the lack of ice depth due to previous year ice melt. I will pay close attention to this time series throughout June to see if this year’s curve follows 2012′s. 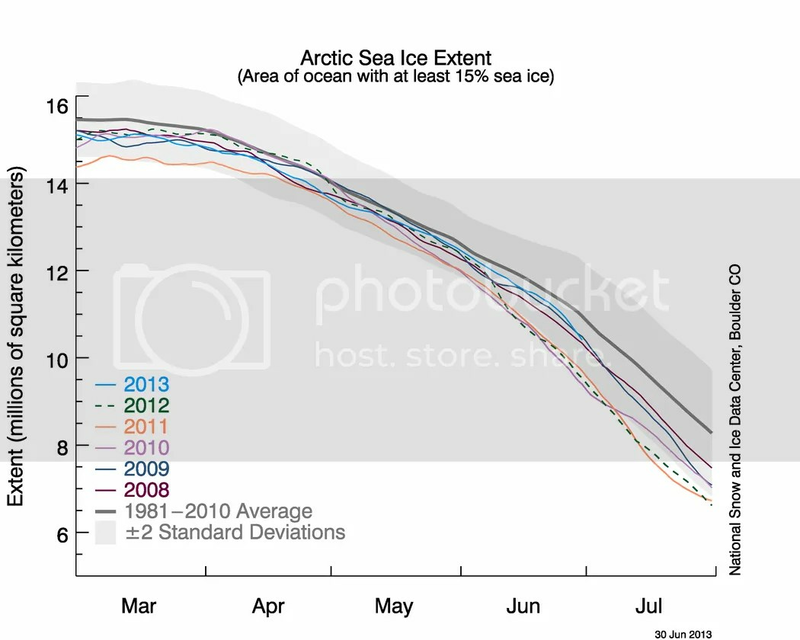 Note the sharp decrease in sea ice extent in mid-June 2012. That helped pave the way for last year’s record low September extent, even though weather conditions were not as a factor as they were during the 2007 record low season. Figure 5 – Graph comparing two climatological normal periods: 1979-2000 (light blue solid line with dark gray shaded envelope) and 1981-2010 (purple solid line with light gray shaded envelope). 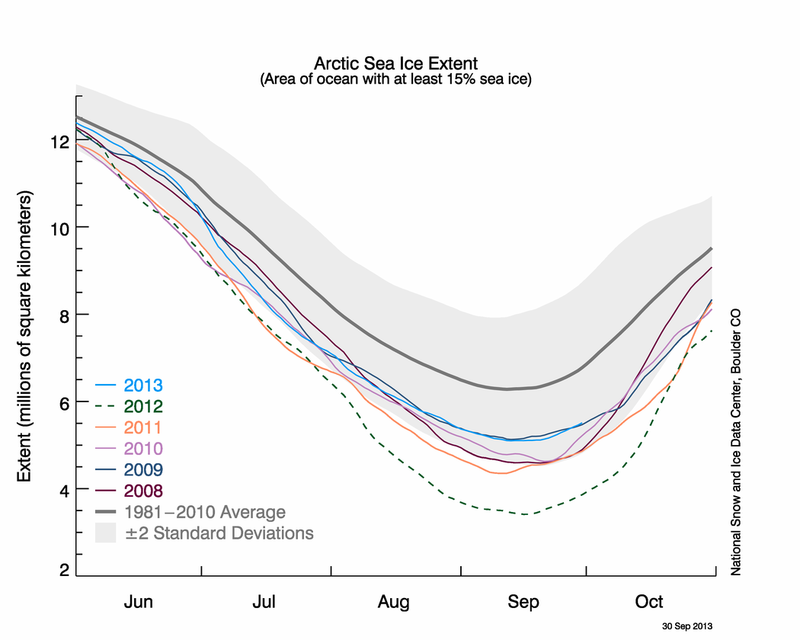 Also displayed is the Arctic sea ice extent for 2012 (green dashed line) and 2013 (light purple solid line). This figure demonstrates the effect of adding ten years’ of low sea ice extent data in a data set’s mean and standard deviation values. The 1981-2010 mean is lower than the 1979-2000 mean for all dates but the difference is greatest near the annual minimum extent in mid-September. Likewise, the new standard deviation is much larger than the previous standard deviation. This means that recent variance exceeds variance from the previous period. This shows graphically what I’ve written about in these posts: the Arctic entered a new normal within the past 10 years. What awaits us in the future? For starters, scientists expect that the annual minimum extent will nearly reach zero. The timing of that condition remains up for debate. I think it will happen within the next ten years, rather than thirty years as others predict. 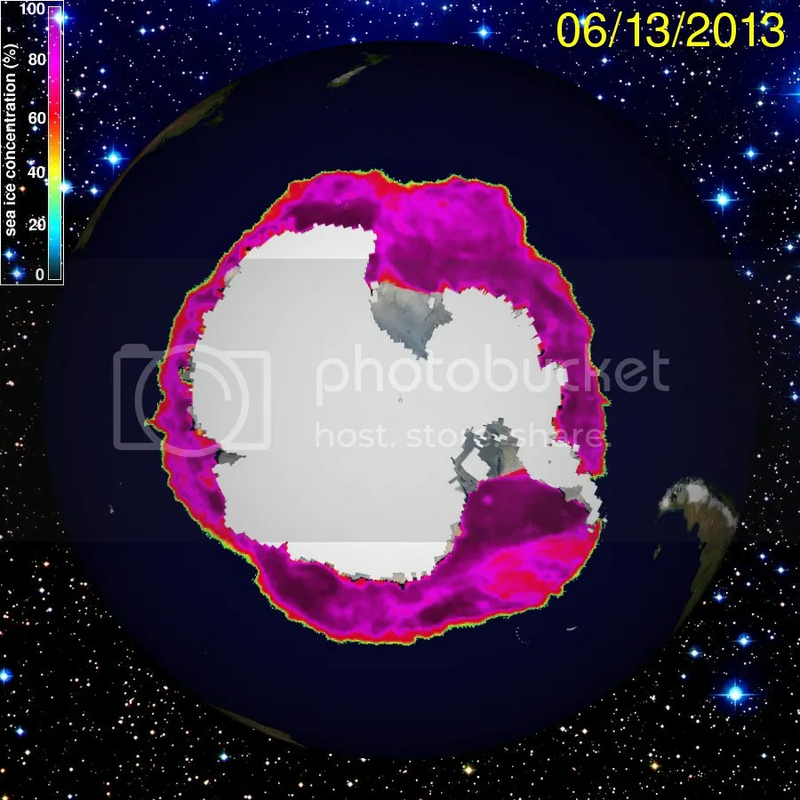 Figure 6 – UIUC Polar Research Group‘s Southern Hemispheric ice concentration from 20130613. 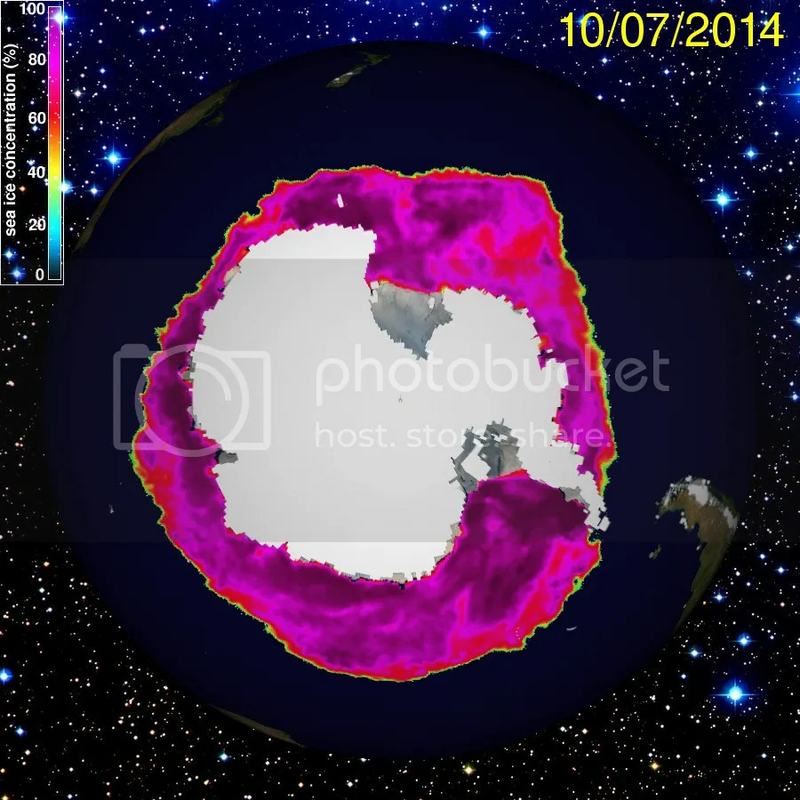 Figure 7 – UIUC Polar Research Group‘s Southern Hemispheric ice concentration from 20130704. Sea ice growth in the past two months is within climatological norms. 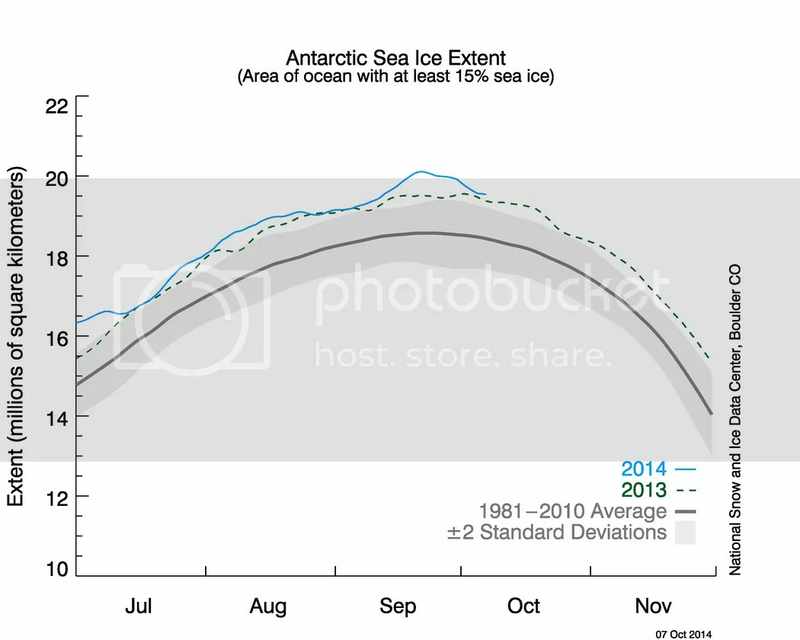 However, there is more Antarctic sea ice today than there normally is on this calendar date. The reason for this is the presence of early-season extra ice in the Weddell Sea (east of the Antarctic Peninsula that juts up toward South America). This ice existed this past austral (Southern Hemisphere) summer due to an anomalous atmospheric circulation pattern: persistent high pressure west of the Weddell Sea. This pressure system caused winds that pushed the sea ice north and also moved cold Antarctic air over the Sea, which kept ice melt rate well below normal. A similar mechanism helped sea ice form in the Bering Sea last winter. Where did the anomalous winds come from? We can again point to a climatic relationship. The difference between the noticeable and significant long-term Arctic ice loss and relative lack of Antarctic ice loss is largely and somewhat confusingly due to the ozone depletion that took place over the southern continent in the 20th century. This depletion has caused a colder southern polar stratosphere than it otherwise would be. Why? Because ozone heats the air around it after it absorbs UV radiation and re-radiates it to its environment. Will less ozone, there is less stratospheric heating. This process reinforced the polar vortex over the Antarctic Circle. This is almost exactly the opposite dynamical condition than exists over the Arctic with the negative phase of the Arctic Oscillation. The southern polar vortex has helped keep cold, stormy weather in place over Antarctica that might not otherwise would have occurred to the same extent and intensity. The vortex and associated anomalous high pressure centers kept ice and cold air over places such as the Weddell Sea this year. As the “ozone hole” continues to recover during this century, the effects of global warming will become more clear in this region, especially if ocean warming continues to melt sea-based Antarctic ice from below (subs. req’d). The strong Antarctic polar vortex will likely weaken back to a more normal state and anomalous high pressure centers that keep ice flowing into the ocean will not form as often. For now, we should perhaps consider the lack of global warming signal due to lack of ozone as relatively fortunate. In the next few decades, we will have more than enough to contend with from Greenland ice sheet melt. Were we to face a melting West Antarctic Ice Sheet at the same time, we would have to allocate many more resources. Of course, in a few decades, we’re likely to face just such a situation. 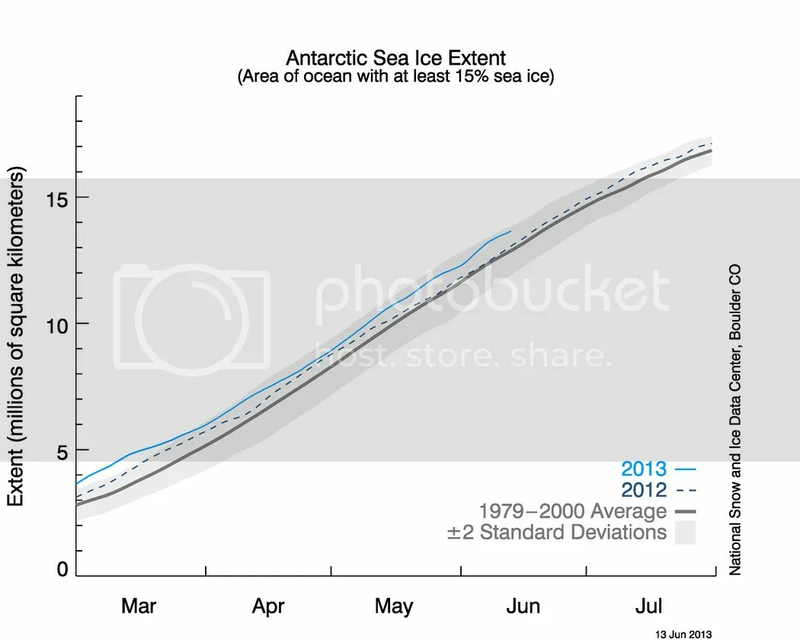 Figure 8 – NSIDC Antarctic sea ice extent time series through early July 2013. The 2013 time series continues to track near the top of the +2 standard deviation envelope and above the 2012 time series. 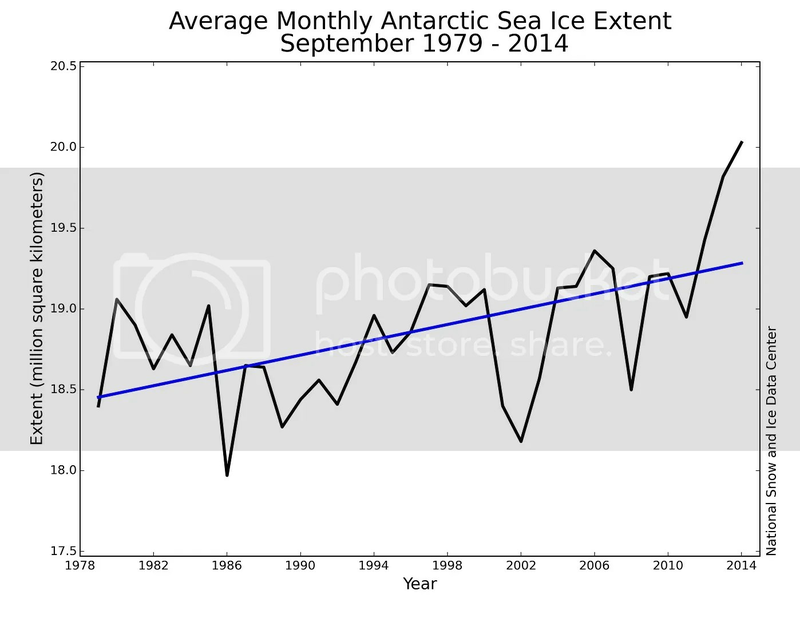 Unlike the Arctic, there is no clear trend toward higher or lower sea ice extent conditions in the Antarctic Ocean. Given the lack of climate policy development at a national or international level to date, Arctic conditions will likely continue to deteriorate for the foreseeable future. This is especially true when you consider that climate effects today are largely due to greenhouse gas concentrations from 30 years ago. It takes a long time for the additional radiative forcing to make its way through the climate system. The Arctic Ocean will soak up additional energy (heat) from the Sun due to lack of reflective sea ice each summer. Additional energy in the climate system creates cascading and nonlinear effects throughout the system. For instance, excess energy pushes the Arctic Oscillation to a more negative phase, which allows anomalously cold air to pour south over Northern Hemisphere land masses while warm air moves over the Arctic during the winter. This in turn impacts weather patterns throughout the year across the mid-latitudes and prevents rapid ice growth where we want it. 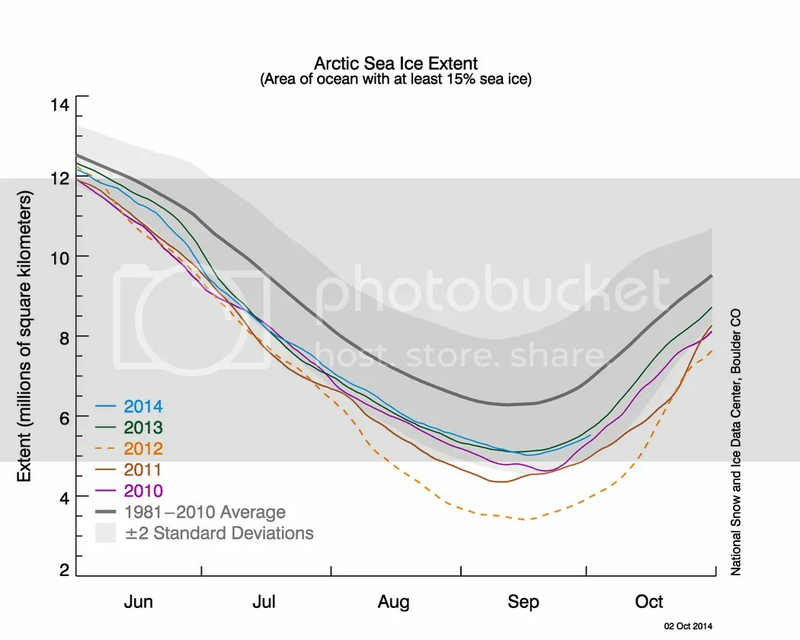 Here are my State of Polar Sea Ice posts from June and May 2013. For further comparison, here is my State of Polar Sea Ice post from July 2012. Global polar sea ice area in May 2013 remained at or slightly above climatological normal conditions (1979-2009). This follows early 2013 conditions’ improvement from September 2012′s significant negative deviation from normal conditions (from -2.5 million sq. km. to +500,000 sq. km.). While Antarctic sea ice gain was slightly more than the climatological normal rate following the austral summer, Arctic sea ice loss was slightly more than normal during the same period. According to the NSIDC, sea ice melt during May measured 1.12 million sq. km. This melt rate was slower than normal for the month, but May′s extent remained below average – a condition the ice hasn’t hurdled since this time last year. Instead of measuring near 13.6 million sq. km., May 2013′s average extent was only 13.1 million sq. km., a 500,000 sq. km. difference. In terms of annual maximum values, 2013′s 15.13 million sq. km. was 733,000 lower than normal. Barents Sea (Atlantic side) ice once again fell from its climatological normal value during the month after remaining low during most of the winter. Kara Sea (Atlantic side) ice temporarily recovered from its wintertime low extent and reached normal conditions earlier this year, but fell back below normal during May. The Bering Sea (Pacific side), which saw ice extent growth due to anomalous northerly winds in 2011-2012, saw similar conditions in December 2012 through March 2013. As it did previously this winter, an extended negative phase of the Arctic Oscillation allowed cold Arctic air to move far southward and brought warmer than normal air to move north over parts of the Arctic. The AO’s tendency toward its negative phase in recent winters relates to the lack of sea ice over the Arctic Ocean in September each fall. Warmer air slows the growth of ice, especially ice thickness. This slow growth allows more melt than normal during the subsequent summer, which helps establish and maintain negative AO phases. 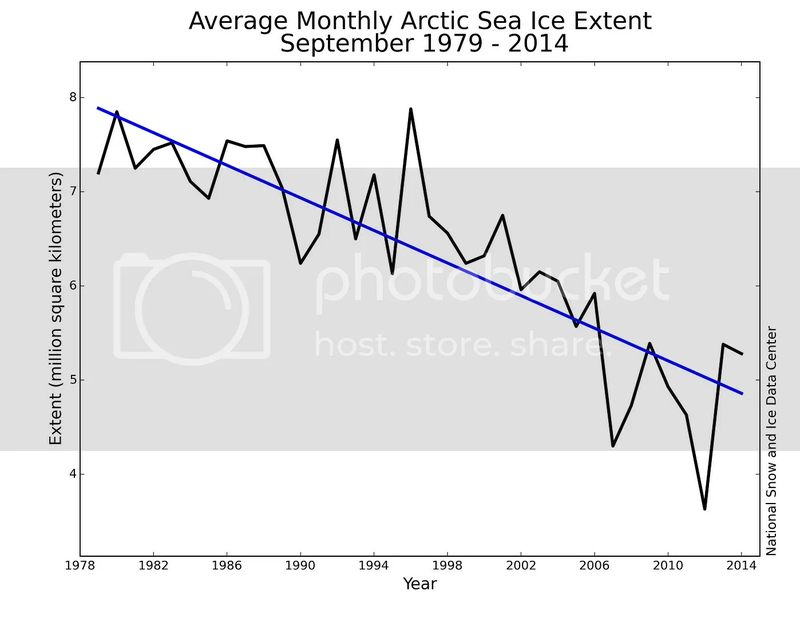 This is a destructive annual cycle for Arctic sea ice. In terms of climatological trends, Arctic sea ice extent in May has decreased by 2.24% per decade. This rate is closest to zero in the late winter/early spring months and furthest from zero in late summer/early fall months. Note that this rate also uses 1979-2000 as the climatological normal. There is no reason to expect this rate to change significantly (much more or less negative) any time soon, but negative rates are likely to slowly become more negative for the foreseeable future. Additional low ice seasons will continue. Some years will see less decline than other years (e.g., 2011) – but the multi-decadal trend is clear: negative. The specific value for any given month during any given year is, of course, influenced by local and temporary weather conditions. But it has become clearer every year that humans have established a new climatological normal in the Arctic with respect to sea ice. This new normal will continue to have far-reaching implications on the weather in the mid-latitudes, where most people live. Figure 1 – UIUC Polar Research Group‘s Northern Hemispheric ice concentration from 20130324. Figure 2 – UIUC Polar Research Group‘s Northern Hemispheric ice concentration from 20130510. The early season melt is evident in the Sea of Okhotsk, the Bering Sea, the Baffin/Newfoundland Bay area, the Barents Sea, and the Kara Sea. Ice finished forming in these regions at the latest point in the winter. As such, sea ice is the thinnest there and most susceptible to weather and solar heating. Weather and ocean currents are also able to transport this ice around and out of the Arctic, as this animation demonstrates. Currents will continue to transport sea ice out of the Arctic, after which the ice melts at lower latitudes. The recent lack of sea ice thickness near the North Pole is also troubling. This is a result of weather conditions from late May through early June that were able to easily push thin sea ice around; this has not been seen before this year. 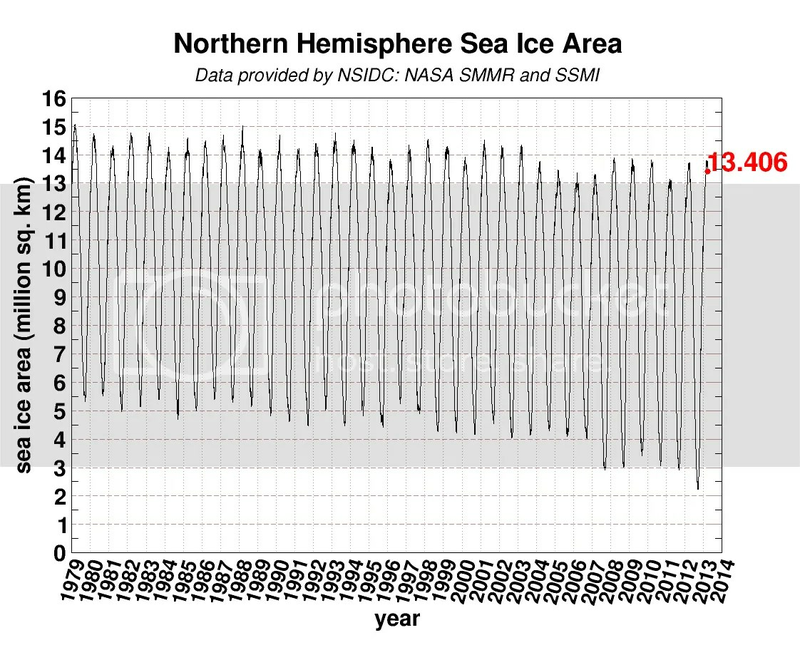 As I mentioned in my two previous series posts, we do not yet know what effect early season anomalies such as vast ice cracks or thinning sea ice might have on end-of-season sea ice extent. We are literally charting new history with these events, which means we have more theories than answers. 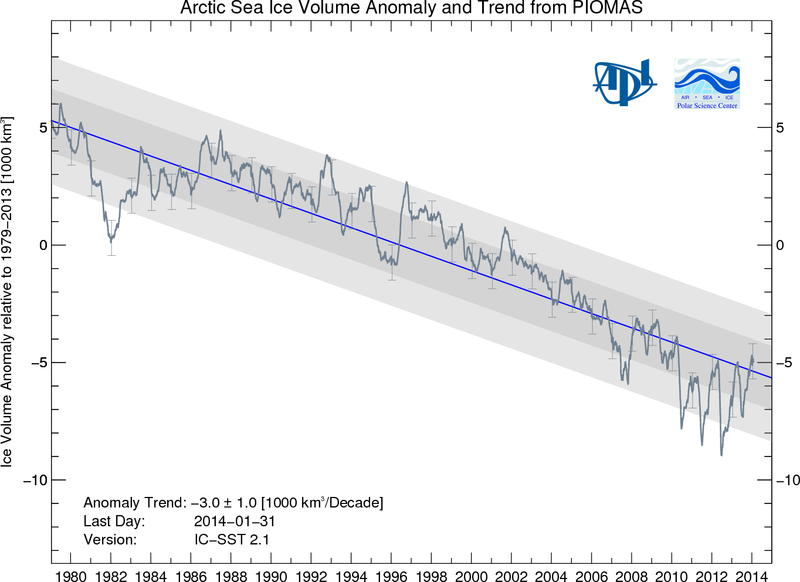 Figure 3 – PIOMAS Arctic sea ice volume time series through May 2013. As the graph shows, volume (length*width*height) hit another record minimum in June 2012. Moreover, the volume remained far from normal for the past three years in a clear break from pre-2010 conditions. Conditions between -1 and -2 standard deviations are somewhat rare and conditions outside the -2 standard deviation threshold (see the line below the shaded area on the graph above) are incredibly rare: the chances of 3 of them occurring in 3 subsequent years under normal conditions are extraordinarily low (you have a better chance of winning the Powerball than this). Hence my assessment that “normal” conditions in the Arctic shifted from what they were in the past few centuries; humans are creating a new normal for the Arctic. Note further that the ice volume anomaly returned to near the -1 standard deviation envelope in early 2011, early 2012, and now early 2013. In each of the previous two years, volume fell rapidly outside of the -2 standard deviation area with the return of summer. That provides further evidence that natural conditions are not the likely cause; rather, the more likely cause is human influence. Figure 4 – NSIDC Arctic sea ice extent time series through early June 2013 compared with four other low years’ data, climatological norm (dark gray line) and standard deviation envelope (light gray). As you can see, this year’s extent (light blue curve) remained at historically low levels throughout the winter, well below average values (thick gray curve), just as it did in the previous four winters. Sea ice extent did something different this spring: the late season surge of ice formation seen in the 2009, 2010, and 2012 curves was not as strong this year. This graph also demonstrates that late-season ice formation surges have little effect on ice extent minima recorded in September each year. The primary reason for this is the lack of ice depth due to previous year ice melt. I will pay close attention to this time series throughout June to see if this year’s curve follows 2012’s. 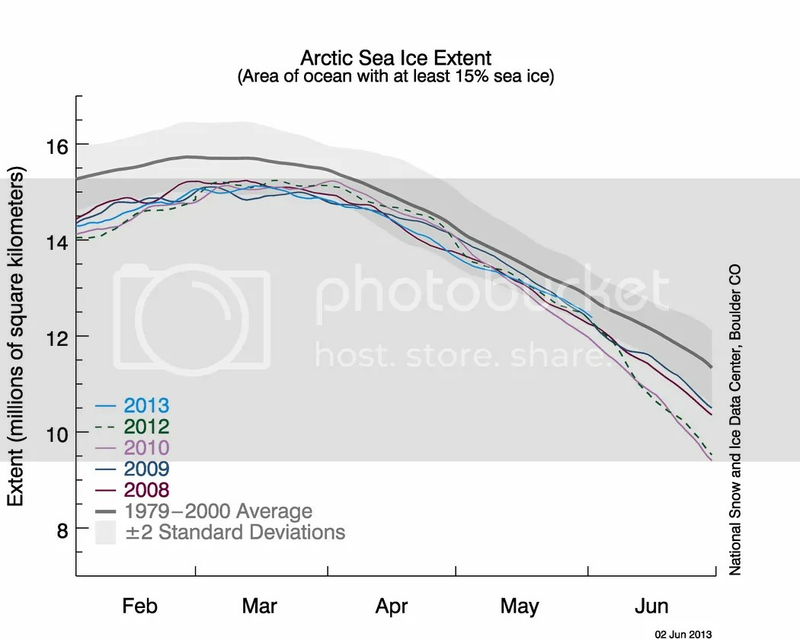 Note the sharp decrease in sea ice extent in mid-June 2012. That helped pave the way for last year’s record low September extent, even though weather conditions were not as a factor as they were during the 2007 record low season. Figure 5 – UIUC Polar Research Group‘s Southern Hemispheric ice concentration from 20130510. 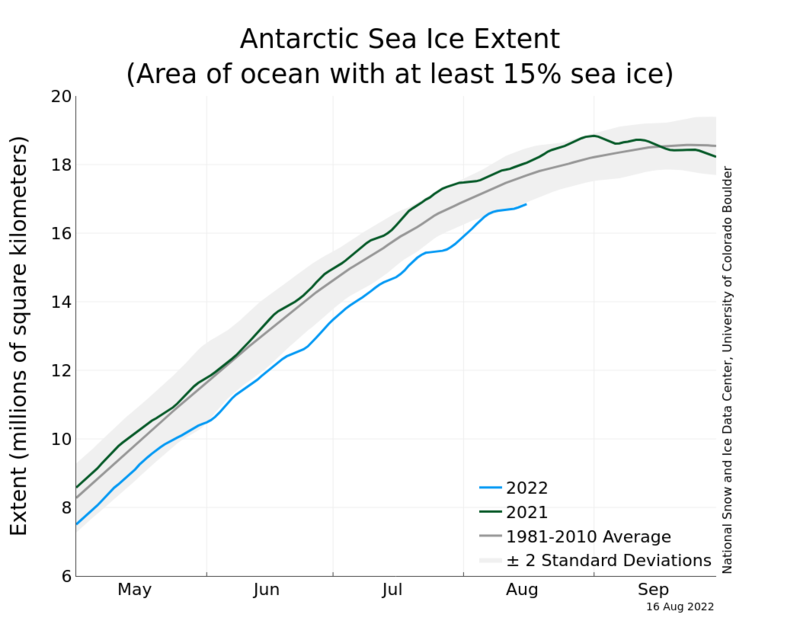 Figure 7 – NSIDC Antarctic sea ice extent time series through early June 2013. Given the lack of climate policy development at a national or international level to date, Arctic conditions will likely continue to deteriorate for the foreseeable future. This is especially true when you consider that climate effects today are largely due to greenhouse gas concentrations from 30 year ago. It takes a long time for the additional radiative forcing to make its way through the climate system. The Arctic Ocean will soak up additional energy (heat) from the Sun due to lack of reflective sea ice each summer. Additional energy in the climate system creates cascading and nonlinear effects throughout the system. For instance, excess energy pushes the Arctic Oscillation to a more negative phase, which allows anomalously cold air to pour south over Northern Hemisphere land masses while warm air moves over the Arctic during the winter. This in turn impacts weather patterns throughout the year across the mid-latitudes and prevents rapid ice growth where we want it. 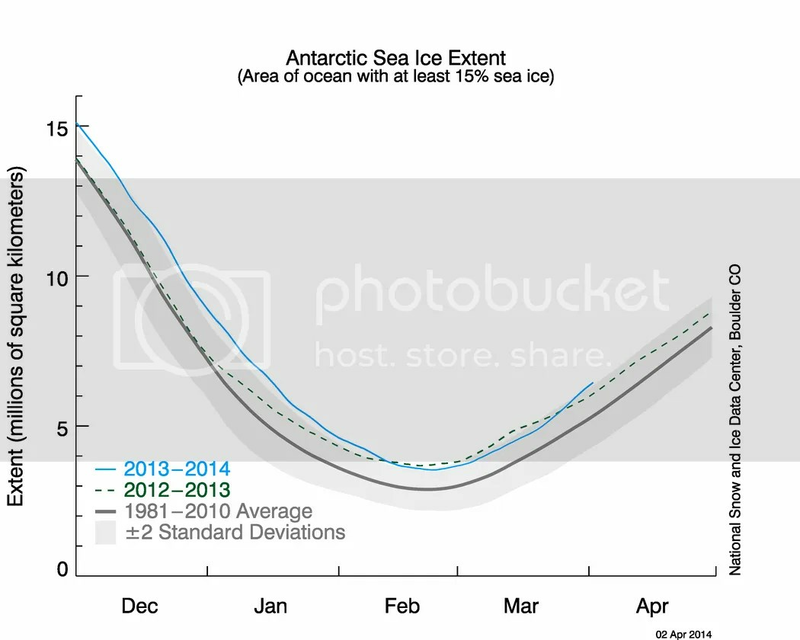 Here are my State of Polar Sea Ice posts from May and March 2013. 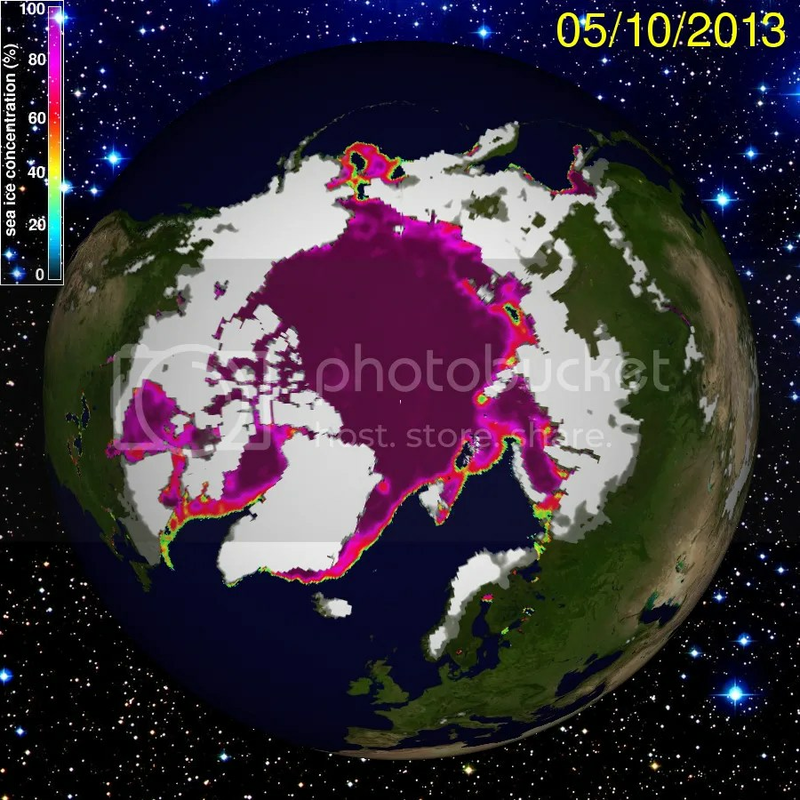 For further comparison, here is my State of Polar Sea Ice post from May 2012. Global polar sea ice area in April 2013 tracked back to climatological normal conditions (1979-2009) from the temporary surplus the previous two months. This follows January and February’s improvement from September 2012′s significant negative deviation from normal conditions (from -2.5 million sq. km. to +750,000 sq. km.). While Antarctic sea ice gain was slightly more than the climatological normal rate following the austral summer, Arctic sea ice loss was slightly more than normal during the same period. 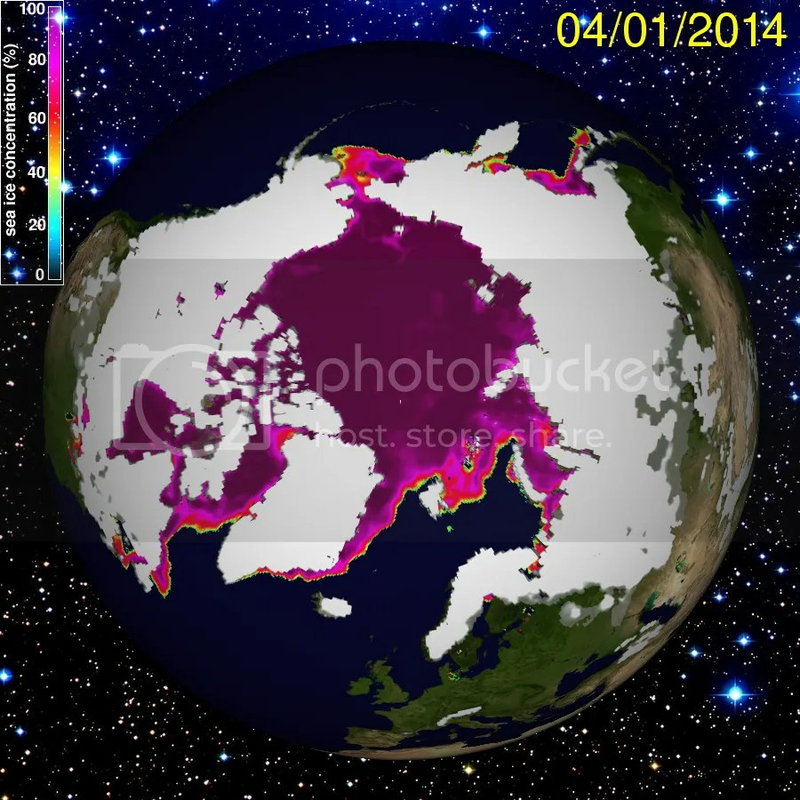 According to the NSIDC, sea ice creation during April measured 1.5 million sq. km. This melt rate was approximately normal for the month, so April′s extent remained below average again. Instead of measuring near 15 million sq. km., April 2013′s average extent was only 14.37 million sq. km., a 630,000 sq. km. difference. In terms of annual maximum values, 2013′s 15.13 million sq. km. was 733,000 lower than normal. Barents Sea (Atlantic side) ice once again fell from its climatological normal value during the month after remaining low during most of the winter. Kara Sea (Atlantic side) ice temporarily recovered from its wintertime low extent and reached normal conditions, which is also different from spring 2012′s conditions, before 2013 melt caused the extent to fall below normal conditions again. The Bering Sea (Pacific side), which saw ice extent growth due to anomalous northerly winds in 2011-2012, saw similar conditions in December 2012 through February 2013. This caused anomalously high ice extent in the Bering Sea again this winter. As it did previously this winter, an extended negative phase of the Arctic Oscillation allowed cold Arctic air to move far southward and brought warmer than normal air to move north over parts of the Arctic. The AO’s tendency toward its negative phase in recent winters is related to the lack of sea ice over the Arctic Ocean in September each fall. Warmer air slows the growth of ice, especially ice thickness. This slow growth allows more melt than normal during the subsequent summer, which helps establish and maintain negative AO phases. 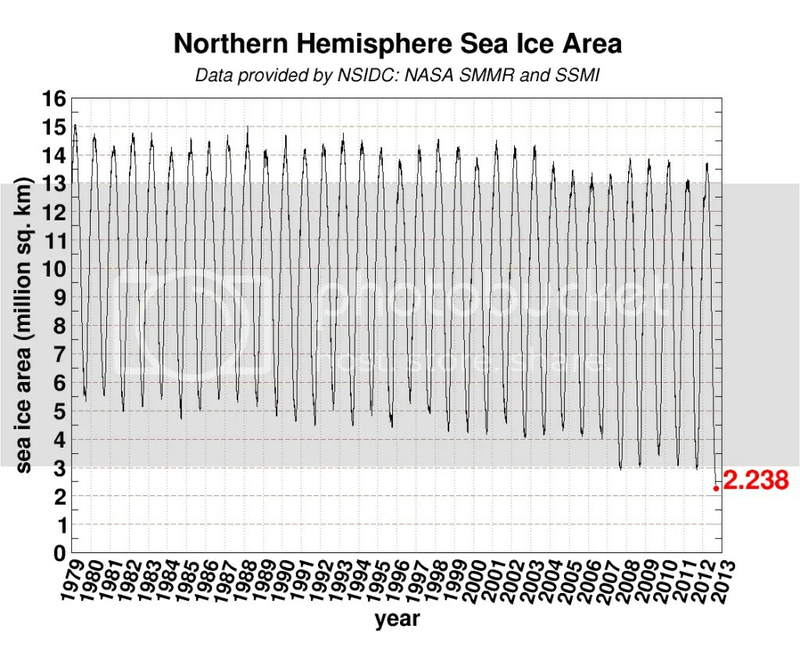 This is a destructive annual cycle for Arctic sea ice. In terms of climatological trends, Arctic sea ice extent in April has decreased by 2.3% per decade, the lowest of any calendar month. This rate is closest to zero in the late winter/early spring months and furthest from zero in late summer/early fall months. Note that this rate also uses 1979-2000 as the climatological normal. There is no reason to expect this rate to change significantly (much more or less negative) any time soon, but increasingly negative rates are likely in the foreseeable future. Additional low ice seasons will continue. Some years will see less decline than other years (e.g., 2011) – but the multi-decadal trend is clear: negative. The specific value for any given month during any given year is, of course, influenced by local and temporary weather conditions. But it has become clearer every year that humans have established a new climatological normal in the Arctic with respect to sea ice. This new normal will continue to have far-reaching implications on the weather in the mid-latitudes, where most people live. For the second time in only six years, and the third time in ten years, global polar sea ice area in February and March 2013 mimicked climatological normal conditions (1979-2009). This follows January’s improvement from September 2012’s significant negative deviation from normal conditions. While Antarctic sea ice loss occurred slower than the climatological normal rate, Arctic sea ice gain was more rapid than normal during February. 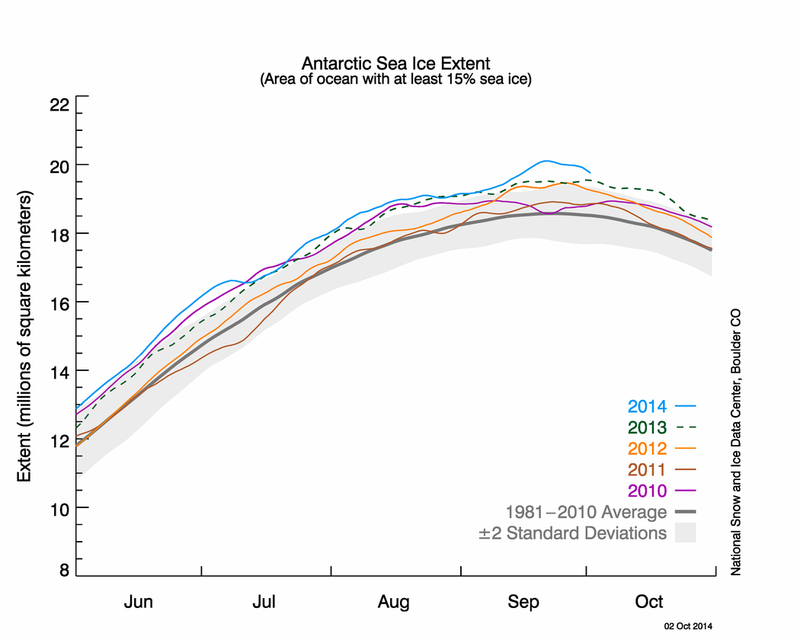 Polar sea ice recovered from an extensive deficit of 2.5 million sq. km. area late last year to a 0.5 million sq. km. surplus within the last week. According to the NSIDC, weather conditions once again caused less freezing to occur on the Atlantic side of the Arctic Ocean and more freezing on the Pacific side than normal this winter. Similar conditions occurred during the past six boreal winters. Sea ice creation during February measured 766,000 sq. km. Despite this rather rapid growth (38% higher than normal), February′s extent remained well below average for the month. Instead of measuring near 15.64 million sq. km., February 2013′s average extent was only 14.66 million sq. km., a 980,000 sq. km. difference! 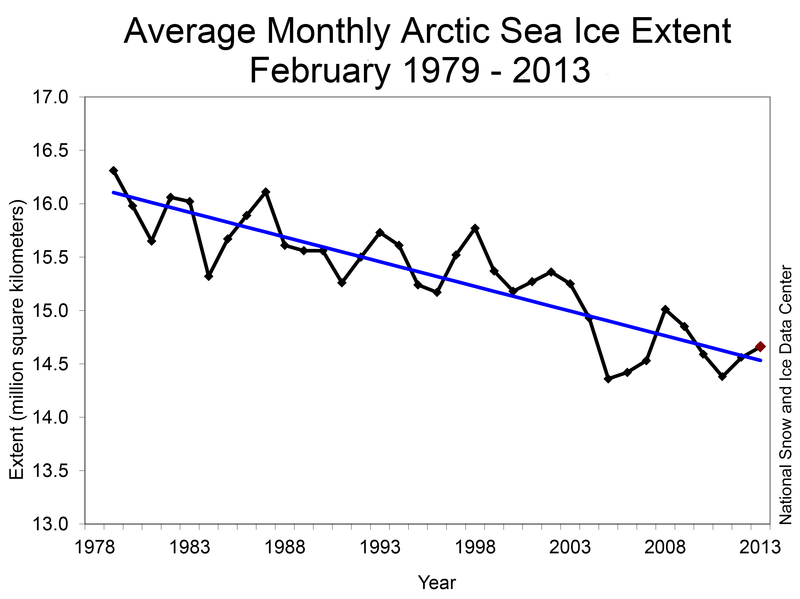 The Arctic likely reached its maximum annual extent about 10 days ago. In terms of annual maximum values, 2013’s 15.13 million sq. km. was 733,000 lower than normal.February’s relatively high rate of ice formation for February related to the lack of existing sea ice at the beginning of the month. Without ice already in the Ocean, new ice formed as winter continued. Barents Sea (Atlantic side) ice finally edged toward its climatological normal value during the month after remaining low this winter, as it did in the past 10 winters. Kara Sea (Atlantic side) ice recovered from low extent the past couple of months, which is different from February 2012’s conditions. The Bering Sea (Pacific side), which saw ice extent growth due to anomalous northerly winds in 2011-2012, saw similar conditions in December 2012 through February 2013. This caused anomalously high ice extent in the Bering Sea again this winter. As it did previously this winter, a negative phase of the Arctic Oscillation allowed cold Arctic air to move far southward and brought warmer than normal air to move north over parts of the Arctic. The AO’s tendency toward its negative phase in recent winters is related to the lack of sea ice over the Arctic Ocean in September each fall. In terms of climatological trends, Arctic sea ice extent in February has decreased by 2.9% per decade, the lowest of any calendar month. This rate is closest to zero in the late winter/early spring months and furthest from zero in late summer/early fall months. Note that this rate also uses 1979-2000 as the climatological normal. There is no reason to expect this rate to change significantly (much more or less negative) any time soon, but increasingly negative rates are likely in the foreseeable future. Additional low ice seasons will continue. Some years will see less decline than other years (e.g., 2011) – but the multi-decadal trend is clear: negative. The specific value for any given month during any given year is, of course, influenced by local and temporary weather conditions. But it has become clearer every year that humans have established a new climatological normal in the Arctic with respect to sea ice. This new normal will continue to have far-reaching implications on the weather in the mid-latitudes, where most people live. Figure 1 – UIUC Polar Research Group‘s Northern Hemispheric ice concentration from 20130211. 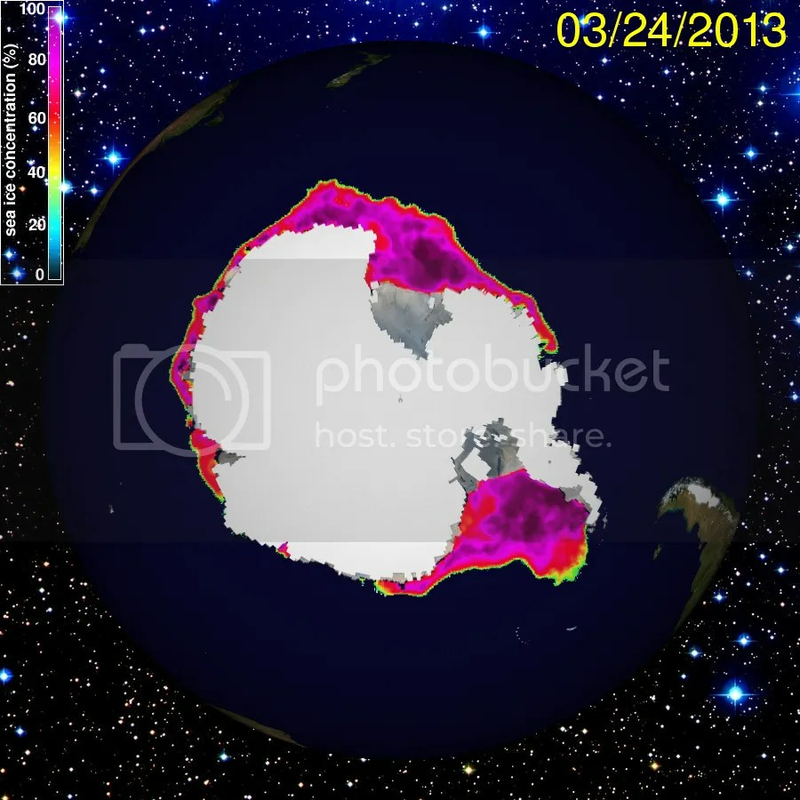 Figure 2 – UIUC Polar Research Group‘s Northern Hemispheric ice concentration from 20130324. As is normal for this time of year, there is not a large difference between these two graphics. Any differences are primarily due to storm systems’ presence that push ice around, or the lack thereof. The lack of sea ice in the Barents Sea (north of Europe) is problematic because wind and ocean currents typically pile sea ice up on the Atlantic side of the Arctic. Sea ice presence in the Bering Sea (between Alaska and Russia) does not alleviate this problem because currents take ice from that area and transport it into the Arctic and then out into the Atlantic. The sea ice on the Atlantic side would be among the first that currents transport and then melt during the spring. With sea ice missing on the Atlantic side, currents will more easily transport Arctic sea ice to southern latitudes where it melts. Many people questioned the overall health of the Arctic ice pack earlier this month when images (like the one below) and video documented extensive cracks in the ice in the Chukchi and Beaufort Seas. A fellow blogger (and new author!) emailed me about this phenomenon and I wrote that I would blog my thoughts on the topic. As Andrew Freedman wrote, “According to the National Snow and Ice Data Center (NSIDC) in Boulder, Colo., this fracturing event appears to be related to a storm that passed over the North Pole on Feb. 8, 2013, creating strong off-shore ice motion. The event is unusual but not unheard of, as similar patterns were seen in early 2011 and 2008. However, the NSIDC said the fracturing this time is more extensive.” The worry is the extent and size of the cracks and leads as well as the early calendar date at which they are all appearing – up to weeks before normal. I found this article on the topic and agree with Greg Laden, the author. The cracks and leads might be a big deal or they might not. 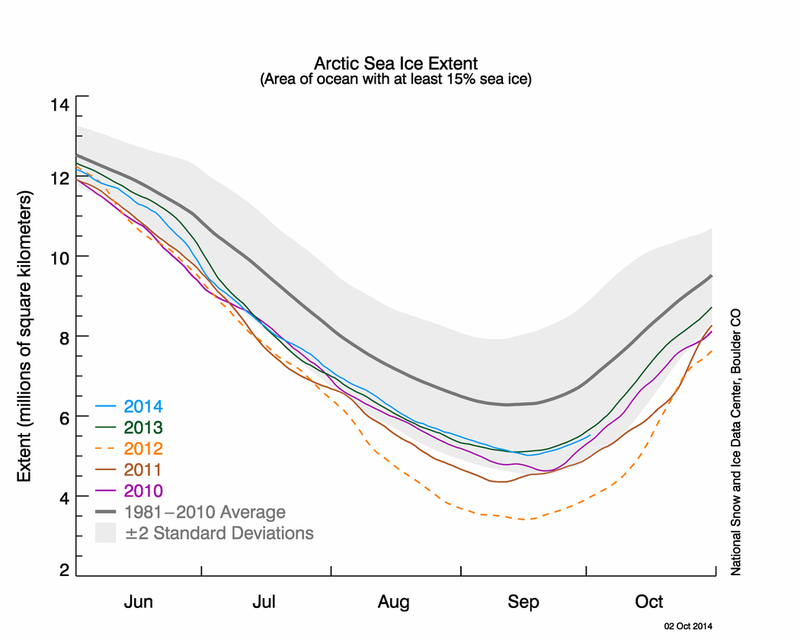 We will have to wait until the minimum sea ice extent occurs in September before we issue judgment. The scientifically sound course of action would be to wait until early cracks appeared in multiple seasons and then see what the range of response later in the year is. For all we know, the cracks could allow for even more ice to form in March than normal and delay the onset of melting. It strikes me as scientifically unsound and even irresponsible to conjecture about the existence and effect of processes, which we do not understand well. 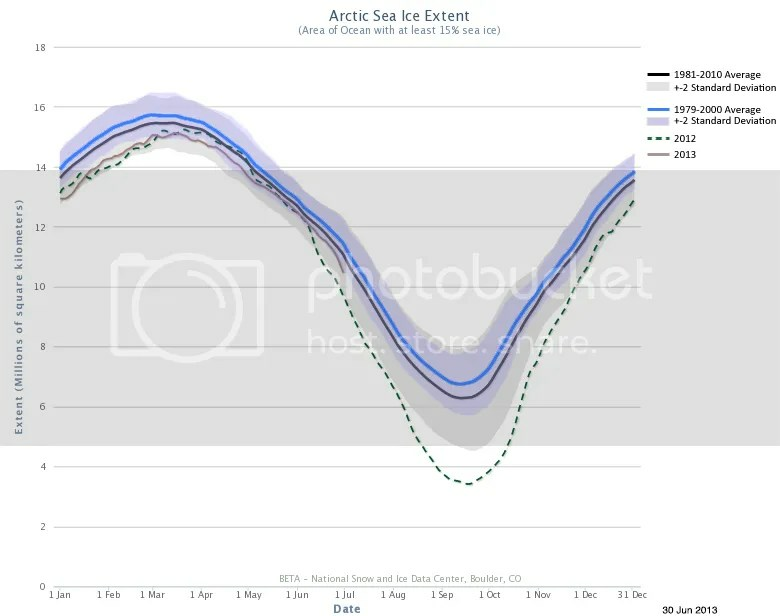 If scientists crow about upcoming devastating Arctic sea ice loss this year and reality doesn’t conform to their wishes, how much credibility with the public do they engender? I think observers should stay patient and discuss the phenomena and effects we do understand – there is plenty of material with which to work! 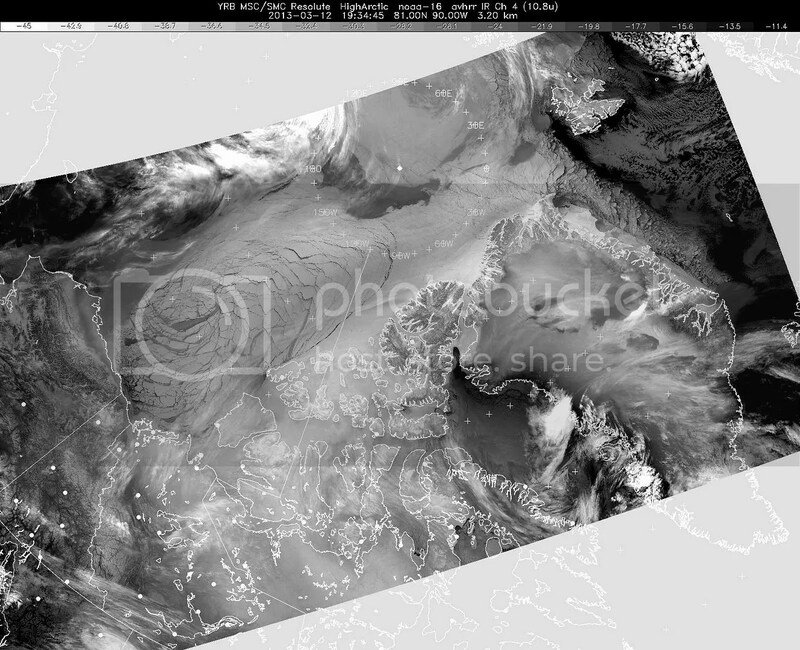 Figure 3 – NOAA AVHRR infrared picture of Arctic sea ice on 20130312. Figure 4 – PIOMAS Arctic sea ice volume time series through February 2013. As the graph shows, volume (length*width*height) hit another record minimum in June 2012. Moreover, the volume remains far from normal since it just returned to the -2 standard deviation envelope (light gray). I understand that most readers don’t have an excellent handle on statistics, but conditions between -1 and -2 standard deviations are rare and conditions outside the -2 standard deviation threshold (see the line below the shaded area on the graph above) are incredibly rare: the chances of 3 of them occurring in 3 subsequent years under normal conditions are extraordinarily low (you have a better chance of winning the Powerball than this). Hence my assessment that “normal” conditions in the Arctic are shifting from what they were in the past few centuries; a new normal is developing. Note further that the ice volume anomaly returned to near the -1 standard deviation envelope in early 2011, early 2012, and now early 2013. In each of the previous two years, volume fell rapidly outside of the -2 standard deviation area with the return of summer. That means that natural conditions are not the likely cause; rather, another cause is much more likely to be responsible for this behavior: human influence. Figure 5 – NSIDC Arctic sea ice extent time series through late March 2013 compared with last five years’ data and climatological norm (dark gray line) and standard deviation envelope (light gray). As you can see, this year’s extent (light blue cuve) grew more rapidly in December than February. This graph also shows that this year’s extent remained at historically low levels through the winter, well below average values (thick gray curve), just as it did in the previous five winters, which are also shown on this graph. In this month’s version, NSIDC also plotted the previous four years’ data (2008 through 2012). You can also see what happened to conditions during late March and early April last spring (dark green curve). A late season freeze surge occurred, which delayed the date of maximum extent by a number of weeks. Last year’s surge has no bearing on what might happen over the next couple of weeks this year. Weather conditions and some low-frequency climate oscillations (AO) are different this year and have more bearing on ice conditions than last year’s date of maximum extent. Figure 6– UIUC Polar Research Group‘s Southern Hemispheric ice concentration from 20130211. 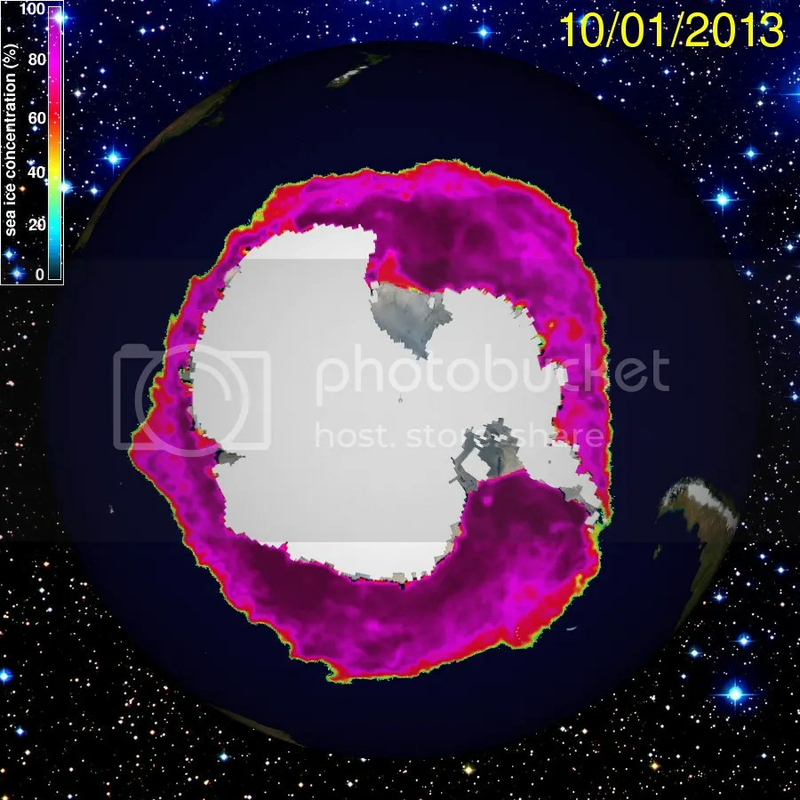 Figure 7 – UIUC Polar Research Group‘s Southern Hemispheric ice concentration from 20130324. Ice growth is easily visible around the continent. There is more Antarctic sea ice today than there normally is on this date in the year. The reason for this is the extra ice in the Weddell Sea (east of the Antarctic Peninsula that juts up toward South America). This ice exists this austral summer due to an anomalous atmospheric circulation pattern: persistent high pressure west of the Weddell sea pushed sea ice north. The same winds that pushed the sea ice north also moved cold Antarctic air over the Sea, which has kept ice melt rate well below normal. A similar mechanism helped sea ice form in the Bering Sea so far this winter. Where did the anomalous winds come from? We can again point to a climatic relationship. The difference between the noticeable and significant long-term Arctic ice loss and relative lack of Antarctic ice loss is largely and somewhat confusingly due to the ozone depletion that took place over the southern continent in the 20th century. This depletion has caused a colder southern polar stratosphere than it otherwise would be, reinforcing the polar vortex over the Antarctic Circle. This is almost exactly the opposite dynamical condition than exists over the Arctic with the negative phase of the Arctic Oscillation. The southern polar vortex has helped keep cold, stormy weather in place over Antarctica that might not otherwise would have occurred to the same extent and intensity. The vortex and associated anomalous high pressure centers kept ice and cold air over places such as the Weddell Sea this year. 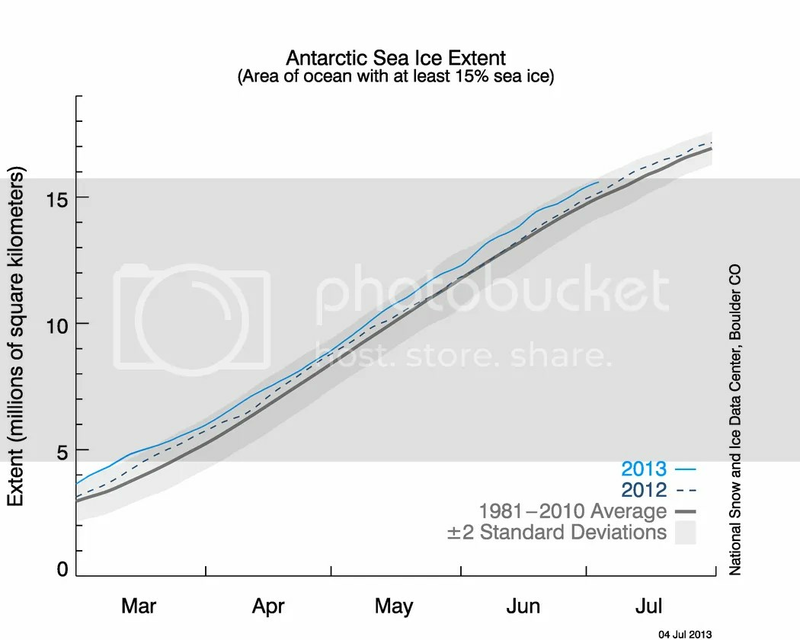 Figure 8 – NSIDC Antarctic sea ice extent time series through late March 2013. Given the lack of climate policy development to date, Arctic conditions will likely continue to deteriorate for the foreseeable future. The Arctic Ocean will soak up additional energy (heat) from the Sun due to lack of reflective sea ice. Additional energy in the climate system creates cascading and nonlinear effects throughout the system. For instance, excess energy pushes the Arctic Oscillation to a more negative phase, which allows anomalously cold air to pour south over Northern Hemisphere land masses while warm air moves over the Arctic during the winter. This in turn impacts weather patterns throughout the year across the mid-latitudes. More worrisome for long-term concerns is the heat that impacts land-based ice. As glaciers and ice sheets melt, sea-level rise occurs. Beyond the increasing rate of sea-level rise due to thermal expansion (excess energy, see above), storms have more water to push onshore as they move along coastlines. We can continue to react to these developments as we’ve mostly done so far and allocate billions of dollars in relief funds because of all the human infrastructure lining our coasts. Or we can be proactive, minimize future global effects, and reduce societal costs. The choice remains ours. 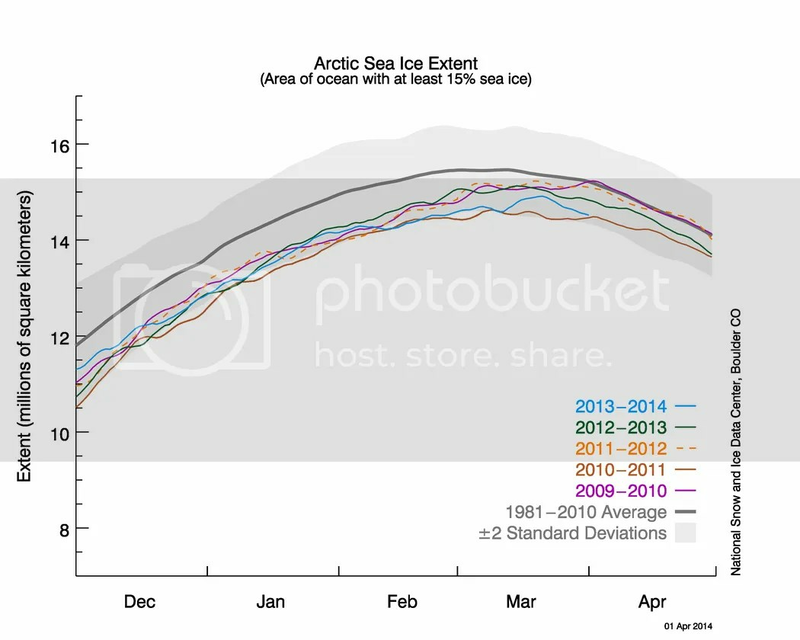 Here are my State of Polar Sea Ice posts from February and January 2013. For further comparison, here is my State of Polar Sea Ice post from March 2012. I meant to include the following two graphs in this post because of the historical nature they represent. 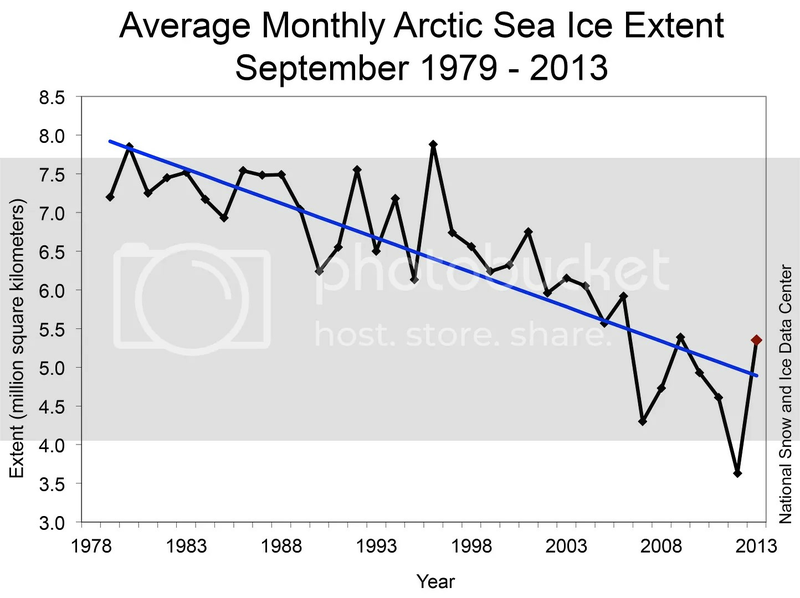 Figure 9 – Time series of Arctic sea ice area from UIUC from 1979 to Sep. 18, 2012. 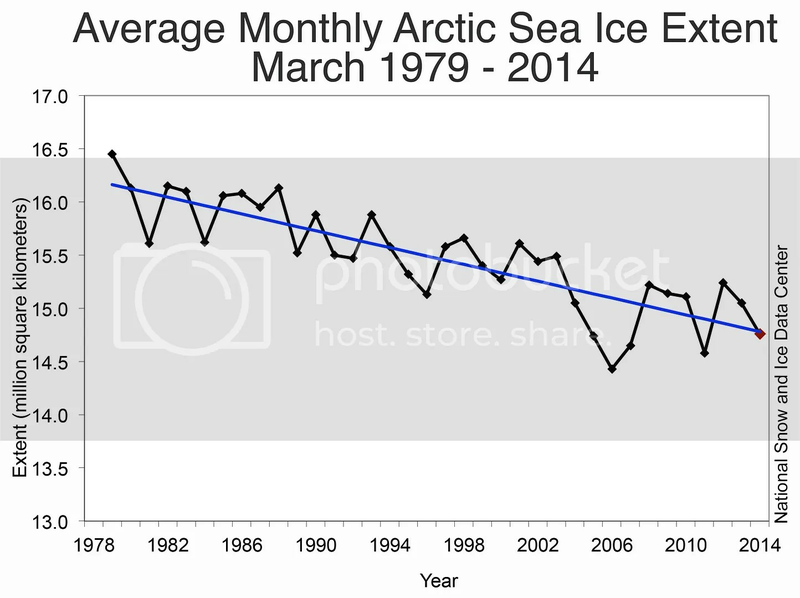 Figure 10 – Time series of Arctic sea ice area from UIUC from 1979 to Mar. 25, 2013. The difference between these two graphics is obvious since they were taken near the time of minimum area (2012) and maximum area (2013). In terms of magnitude, the freeze season of 2012-2013 produced the highest amount of frozen ice area in the modern record (11.168 million sq. km.). The value of ice area last September was the lowest on record and the value of ice area earlier this month was the highest in four years. March’s area value occurred because of the factors I discussed above that boil down to this: the relative lack of thick ice in recent winters permitted rapid ice growth, albeit thin ice that melts quickly the following year. In addition to new record low area values in the future, significant oscillations from minimum to maximum and back again are likely to occur in the future as well. This does not contradict climate change; it is a manifestation of climate change. I hope write more about this topic soon, but countries are reconstructing international policy (military and economic) as a result of the changes seen in the Arctic. Those policy shifts will have societal repercussions, which I venture say few people realize today.